Baji is a very famous Indian snack. It is similar to Pakoras but tastes entirely different. Checkout the pakora recipe here. This food is prepared in less than 10mts if you have all the ingredients. 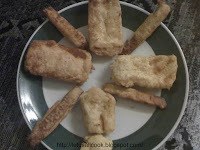 You can show your creativity in this food by making different kinds of baji. Some of my favourites are Onion, Egg, Potato,Bread,Plantain, Green Chillies. You can make even with Meat ( I am not sure, but what the heck ? you can try it and if it doesn't come out well, feed the bin). Add the gram flour, chilli powder , baking powder and salt in a bowl. Mix well adding water so that it becomes a smooth paste. Now dip the ingredient you want to make baji with and deep fry in oil. Make sure that the ingredient i.e. potato or bread is covered with this paste properly so that the baji comes out tasty and puffy. Do come back for my recipe on making stuffed Mirchi (Green Chilli) Baji which is the most famous baji variety in India. I will post the recipe asap.